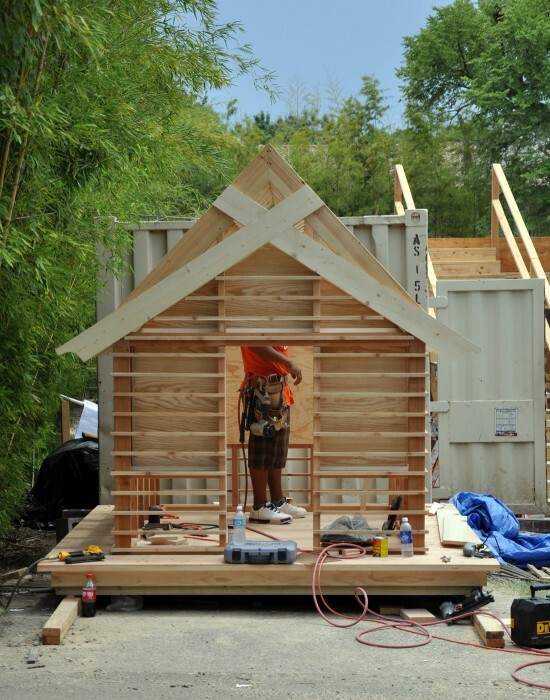 The 2010 CASA Parade of Playhouses event is about to begin so construction has finally started on my entry. There is some history between me and this event and I have written some some earlier posts on the subject. The history of me and the event can be found here, the original design concept for this years entry can be found here, and the construction documents are here. What I wanted to show you today is the progress on the construction of this entry. I designed this years entry for ORIX USA, the events major underwriter. I also did their entry last year and I think they were pleased enough to ask me to design another one for them. I asked the same contractor as last year to build this one, Barry Buford at Buford Builders. He is a great contractor and a better human being so he agreed to help out. This was a great relief because I knew that they would do a great job – they take the whole “my name is on this” really seriously. I think that it is coming along pretty much exactly as drawn. I spent enough time, and took what I learned from last years event, to prepare more efficient drawings and details so that we could keep the construction costs down and the quality high. The biggest difference between this years entry and last years is that I focused more on the construction aspect so that I could streamlined the construction. To put it in perspective, last years entry, with it’s folding doors made from Spanish oak and polycarbonate infill panels, took about 3 weeks of stopping and starting to get everything done. 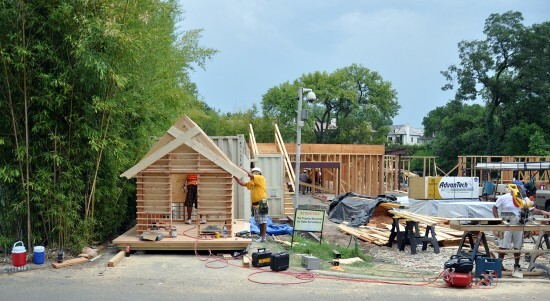 By comparison, the construction of this years playhouse started on Friday, they guys worked Saturday and part of Monday and they are almost finished. 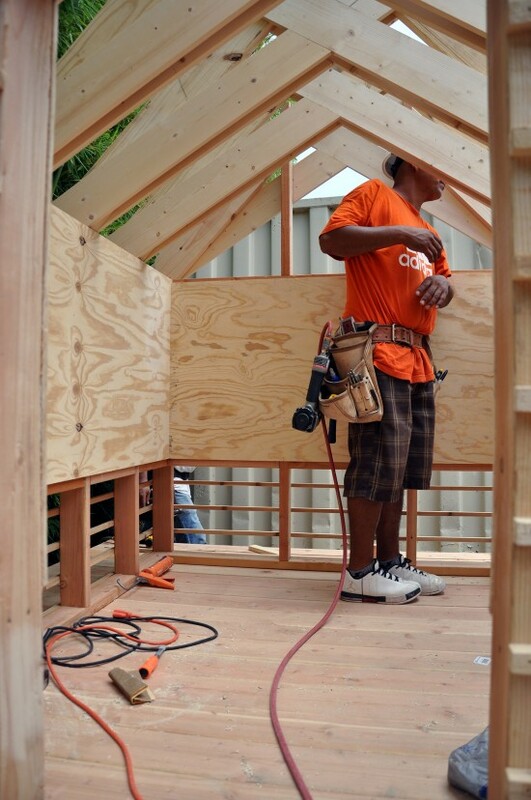 I reduced the number of crews and trades that needed to work on this design down to two – trim carpenters and painters. 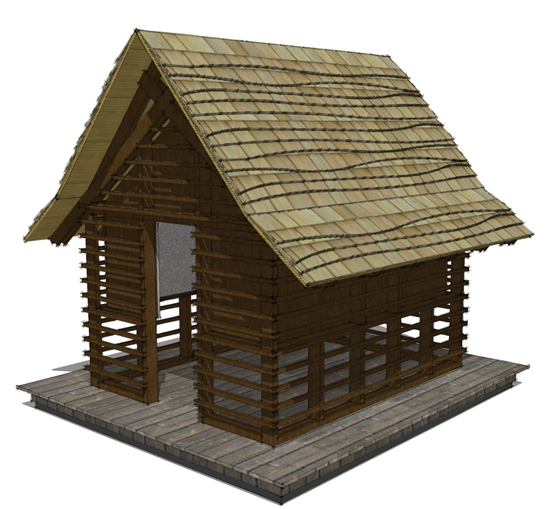 This is my design – I based it on rural agrarian Japanese buildings while trying to take budget, size and constructability into major consideration. Feedback from ORIX USA and from CASA themselves has all been positive so I am excited to have this playhouse built and put on display – I have my ego and competitive nature working here but in this case, I think those character traits work for everyone benefit. These playhouses have size restrictions so that they can be easily moved through doors and into position while on display. They can be no larger than 8’wide x 8′ tall x 9′ long – plenty large enough for a playhouse but the issue of scale becomes incredibly important. I know that sounds like a stupid thing to say – when is scale not important? The scale on these playhouse is more akin to what you might see at Disney – I could scale this design up or down and the proportions would still work. This is a shot of the entry and you can see that even the smallest of full size grown-ups will have to duck down to enter. That was actually intentional for a few reasons. I wanted to maintain the overall scale and relationship of all the parts to one another, but I also wanted the door to be sized for it’s intended occupants – children; after all, this is a playhouse for children. I will point out a mistake – maybe more of an oversight. The 1×6 rafters are supposed to be 1×4’s. The more I look at it, the more it drives me crazy. It’s my fault because on my construction drawings, I just labeled the rafter’s as 1x’s. Things are moving so fast that I didn’t notice it when the first one went up. I was so excited to see them going up, I overlooked it. Steve – the head awesome guy who is building this, is really paying attention to what he is doing and those rafters (if you can’t tell) are in the same plane so he glued, finished nailed and used biscuit joint’s to put them together – it is a thing of beauty. So in the end, I think only the designer cares that those are 1×6’s instead of 1×4’s. Here is a side view of the rafters and how they come together. A closeup view of the 3/4″ x 3/4″ banding that goes around the exterior. 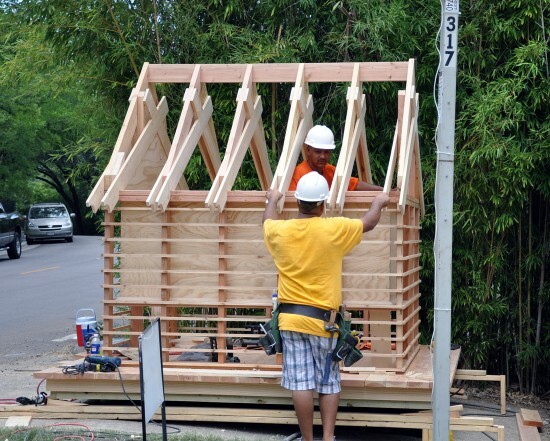 This actually serves two purposes: the first is to provide an additional level of detail and fenestration, but is also helps meet one of the display requirements which is to make the interior of all these playhouses secure while they are on display. Some of the other playhouse designs require a boatload (that’s a lot) of Plexiglas to be screwed over openings and gaps to protect entrance to the interior, but I don’t like the idea of doing that. Also, see how I held the first band 3/4″ off the deck? 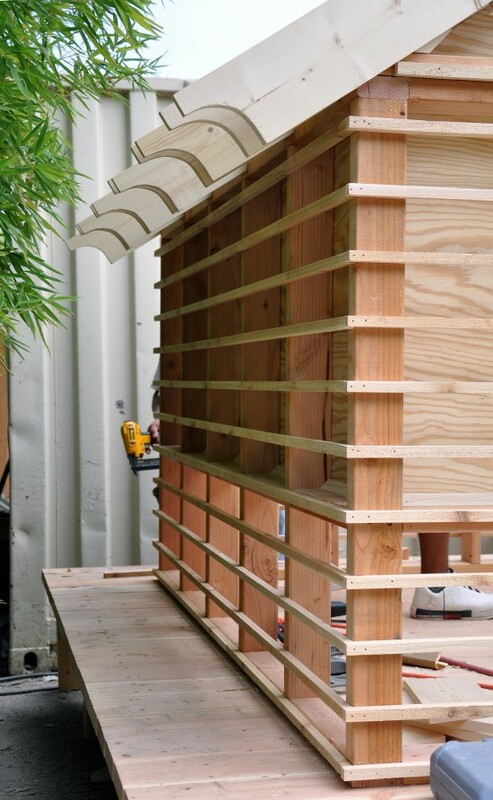 That is to help create a shadow line – which provides some construction tolerance to the guys building this playhouse, and it will help keep that piece of trim from rotting if I were to locate it directly down on the deck. Nice. The plywood that you see in the interior will receive a layer of homasote – a pressed paper product – that we will sand down and leave unfinished. Just below the plywood, where you see the edge of the 2×4 member, there will be a bent steel metal rail that will project into the interior space 3″. This will give a tack-able surface on the interior with a shelf just below for placing “collections” and “supplies”. I actually think I am going to put a whole bunch of CrazErasers on the shelf while this playhouse is on display. The weather might not cooperate with us today but the stain is supposed to go on this morning. Once that happens, the reed ceiling can go on, followed but the plywood deck sheathing for the roof and the undulating cedar shakes. I am really excited for the roof component to go on because it is the piece that will really complete the design. I also like the fact that I have included Steve (remember Steve? He’s building this playhouse) in the process and he is going to help cut in the pattern on the cedar shakes. It’s a big deal but his level of pride and craftsmanship give me confidence that it is going to turn out great. But I’m still going to be there for the installation. 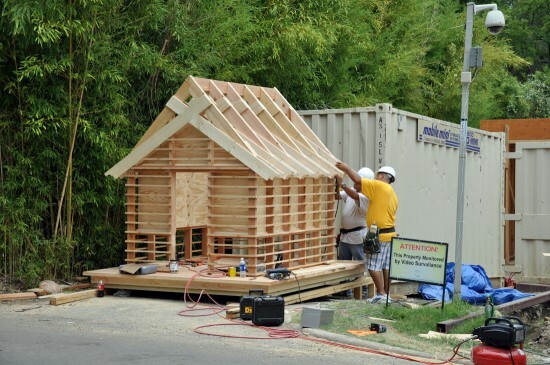 I will follow up with another round of posts covering the final product, the playhouses that were part of the AIA YAF competition (the results are here), as well as some images of the rest of the playhouses. There will be 17 total for this event, the most ever so I am expecting this years event to be a great success. It's Christmas: Want a new Brizo faucet for free?